A few weeks ago, I received an email from a reader, telling me about Master Crab Seafood Restaurant, a cze char place in Ghim Moh near De Burg burgers. The title of her email was: “best crabs in Singapore“. I think that pretty much sums it up. Anyway, I could not stop thinking about the yummy crabs, so a few days later, I brought my family to Master Crab for dinner. Apparently, Master Crab Seafood Restaurant also has branches in Choa Chu Kang (Sunshine Place), Compassvale, and Punggol. I was a little alarmed when my family wanted to have the Black Pepper Crabs as we had Chilli crabs recently. Luckily, I managed to convince them that it is a must to try the famous Singapore Chilli Crab since it was our first time at this crab restaurant. Sad to say, Master Crab’s Chilli Crab ($48/kg nett) was lackluster – I could not quite put a finger to it, but the chilli gravy was kind of weird. If you go to Master Crab Seafood Restaurant, order their Salted Egg Yolk Crab instead. Covered with a golden-yellow sauce, the Salted Egg Yolk Crab was magnificent. The sauce, in particular, was rich and very tasty. I am certainly not the first person, nor the last, to sing its praises. It’s been said before, and I shall say it again: crab prices are getting ridiculous in zi char restaurants. I understand why seafood restaurants like Seafood Paradise and NoSignBoard need to charge $40ish/kg as they are paying higher rentals. But it does not make sense to me why Zi Char places are charging the same amount. Master Crab’s har cheong kai ($8) was not too bad. It had a thicker coat of flour which gave it a nice crispy skin. We wanted to order something different from what we usually have, so we went for the Deep-fried Youtiao Fritter ($8), which was run-of-the-mill. The Scallop Asparagus ($15) was nothing like the menu’s photo, it only had a few tiny scallops. For that kind of price, I would rather order two different vegetable dishes. Master Crab Seafood Restaurant, like the name suggests, is a good cze char place to go for their crabs. The other dishes are pretty standard, nothing outstanding. The other signature crabs on the menu are: crab bee hoon and stewed crab with vermicelli. Sauce eggs with crab look very interesting, do you think could be works if i made with a hollandise sauce? 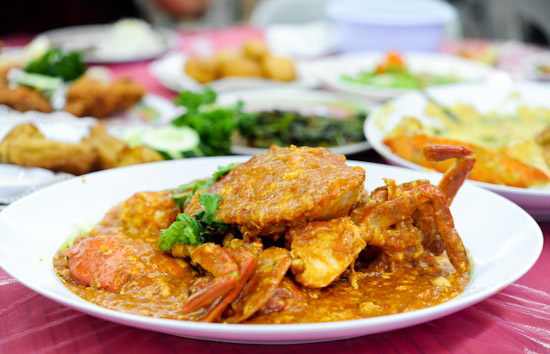 You have to try the chilli crabs at Tan Chin Lee Sea- Fresh Restaurant! It is located at Tuas Ammenity Centre and its cheaper than the usual zi char places if I am not wrong. Their fried durian is to die for too! agreed… Food is lacklustre… We had the crab beehoon a couple of days ago (our maiden trip), the sauce was thickened with cornflour probably and too salty. However, the crabs were huge and fresh. The waitress recommended steamed fish with fried garlic, which was definitely not up to mark, the soy sauce marinate just didn’t taste right. My sons asked for kung pao frog legs, the dish came out in a claypot, the kung pao sauce had some kick in it, so that was a plus. Overall, nothing to crow about… Mom paid the bill, so not sure about the damage done…. Actually, each branch of Master Crab has its own specialty crab dish. Find out from the staff what is their signature dish, and order that. For Punggol, I love the crab bee hoon soup. Best I’ve had so far. OOPS. my above comment is referring to the outlet at Punggol Field. I went to Ghim moh branch, Waitresses are rude and have attitude problems. Order 3 crabs, they mixed in 1 crab that is not fresh, the crab meat is watery, and the legs are off the body. And each crab is $40. Will not go there again, and I don’t recommend that place also. I went to Ghim Moh’s branch recently and I will not go there again as I realised (the next day) that I was given the wrong receipt which was 200+ where my order may perhaps sum up to only a little more than 100. The crab wasnt fantastic and it is pricely. It was just over-rated. I always go to Compassvale branch (Buangkok MRT). So far the service is good and the foods are great. If you compare with No-signboard (Geylang), the egg yolk of No-signboard’s crayfish is more delicious compared to the egg yolk of Master Crab’s crab. I went to the Ghim Moh branch with my friend from Hkg. Very dissapointed with the service and worst the price. I ask for Sri Lanka crab and they say dont have and only have Veitnam Crab. Never had before and i say how they charge. She reply min charge 900g+ at SGD55 per KG and min 2 crab. I only have 4 person to eat and wanted to eat other as well. Well I say go ahead and end up guarantee you the crab is much smaller and lighter. One bigger crab was totally not frsh and meat very soft. Another crab was ok. It cost me SGD99. It shows that they give you not fresh and much smaller(about 1.5Kg top) and charge you at their minimum price. Seriously not worth it. I will not visit it again and eventhough the taste consider not bad to good. 5 small cereal prawn at SGD18 is consider rob in singapore with a Kopi Tiam style chi char price like Restaurant. Order also Pork with special sauce. The pork was very hard and we did not finsih it. Overall rating 4 out of 10. Worst a try but not a second visit. on 10/January/2015 at dinner time approx 8pm ++, we were dining at Ghim Moh outlet. - she asked us how many pieces have we eaten & will only replace the same balance pieces for the coming dish !!!! This is totally ridiculous !!! We paid the bill and left. Anyway the source doesn’t taste that great too… Too over rated…We will never go to Master Crab even again !!!!!! Wow so many unhappy comments at ghim moh can I know anyone went to choa chu kang master crab any good or bad comments? We were treated the worst attitude in our life, just simply asking this girl “Sorry, could you kindly check on our orders”. As we have waited at least 30 mins, and people who came before us have already taken their orders. If you treat her with respect and politeness, her attitude will just blow you away, and make you more cynical to being nice with manners in future. If you seriously need to order food from her, just be barbaric as you can, since she probably deserves it. BANNED this restaurant until they sack this stupid staff. Went to punggol branch was in for a real surprise . . Picked 3 crabs tt add up to 350 sgd . . Nvm abt the price, the crab taste dead n liveness without any bouncyness in meat and the waitness n boss was simply rude to their core . . I wonder why there is no qc or punggol ppl are just stupid since their business is still good . . I will nv in my life visit any of their branch and wish no ppl get sick from their comtamined food as i vomit n diaherroa the very next day. . Hope the gov will do more check on this. . It doesnt need a gourmat to figure out how unfresh their crab is . . And my frend overhear the waitness shout this customer cannot change crab which means . . they CHANGE our crab! Their crabs are no longer as fresh so there is no guarantee that u will get fresh crabs with your visit having to pay for the crabs at restaurant price and sweating out in a hot air coffeeshop.